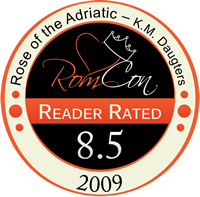 5 Stars from Books, Books and More Books. "This tale is deeply spiritual while still being an excellent romance and well told story." Wounded and faithless, Dr. Matthew Robbins arrives in a small Croatian village determined to discredit the visionary who claims to see the Mother of God. Matt believes only proven facts, and he's sure Anna Babic is either lying or delusional. But, despite all his unpopular testing, he can’t disprove Anna’s visions--and what's worse, he finds himself falling for the beautiful visionary who speaks with the blessed Virgin Mary. Anna came down the aisle and slowly neared the kneeler. She stood in front of it, the chain of her rosary beads dangling near Matt’s ear. Her pleasant, powdery scent brought a spontaneous smile to his lips. He squelched it, relieved she hadn’t seen, and also confused by the distraction when he had work to do. Anna knelt, an apparent signal for the rest of them to follow suit, and continued to lead the prayer recitation. On his knees, hard stone against bony kneecaps, all Matt’s muscles tensed for action. Anna’s right elbow rested on the front railing of the kneeler, inches to his left. Her three-quarter length sleeves left her exposed forearm a perfect target. Mid-sentence, Anna’s prayer ended. Matt glanced left. Her eyes were upturned and fixed on a point on the far wall. He registered the transformation of her features, glowing angelic. He opened his bag and slipped out an alcohol wipe and the first needle. Matt shuffled sideways on his knees pulling his doctor bag along the floor in front of him. Ecstasy radiated from Anna’s features and it made Matt hesitate, breathless, wishing for a split-second that he had put that expression on her face. Such joy. Like she emanated pure love. Focus. He’d process his conflicting response to her later. Matt swallowed his guilt, swiped the antiseptic down Anna’s forearm using his left hand and sunk the needle in her flesh with his right, exerting minimum pressure while he watched her face. No reaction. He dotted the piercing along her arm. Nothing. He pulled a lancet from his bag and snagged her right thumb, angled back from her prayer-clasped hands. He jabbed it a couple times, squinting his eyes, his gaze riveted on her face. No reaction other than a few droplets of blood. Maybe a larger gauge needle. Stirrings began behind him. He was running out of time. Dr. Matthew Robbins gave up on God and his family when he was eight years old. Science is something he can depend on. It can be proven, seen, tested. When his best friend and mentor seems to succumb to a visionary in Valselo Matt is determined to prove the whole thing is a hoax and get his friend back. His confidence is shaken when none of his scientific determinations are any help. Anna Babic seems to be someone special, a person the humanity and searching part of Matt is drawn to in a way he never expected. K. M. Daughters writes an excellent tale that could be the life of any visionary we have heard or read about around the world. The personalization of the tale helps the reader see the life of Anna as spiritual but human. The Mother of God appears to speak to her in a special way during their times together but at other times she's just a young woman we can relate to in so many ways. She has hopes and dreams which Matt becomes a big part of. 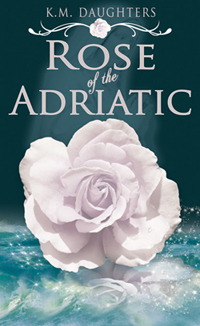 "In ROSE OF THE ADRIATIC, author K.M. Daughters takes up back to the setting of her debut novel, Jewel of the Adriatic. Hundreds of pigrims each year journey to the village of Valselo, Croatia where three visionaries have daily visits with mary, Mother of God. Anna Babic is one of the Visionaries. Young, beautiful and fully devoted to Our Lady and to serving God, Anna is treated like a celebrity by villagers and visitors alike. Matt Robbins is a non-believer whose faith was shattered as a child. He has travelled from the U.S. for one reason: to prove the daily conversations are nothing more than pure nonsense. Matt is a doctor, a scientist and stem cell researcher. Rumors of miracle cures do nothing to convince him to call off his testing of Anna in hopes of finding scientific proof of a hoax. From the first meeting with Anna, Matt cannot help but be mesmerized by her beauty and her honest soul. His attraction to her is immediate and he endeavors to shake off his reaction in order to carry out his work. Anna is certain that Our Lady has called Matt to Valselo to find his lost faith. Anna wants nothing more than to serve God and to one day have a family of her own. Day by day, Matt works harder to finish his work and to ignore his growing feelings for Anna. Can Matt continue to disregard all that he sees and feels? Can he keep up his conviction to finding a fraud? Is this skeptical American the answer to Anna's prayers for a husband and a family? Can she help him to open his heart and mind to his faith? "Dr. Matt Robbins has made the journey to Valselo, to prove to the people there that they were being misled. Eighteen months earlier Dr. Harry Sheridan, head doctor of a research lab let his crippled wife make the trip to Valselo only to have her return fully recovered and walking. After many test were run on the visionaries and no proof was found , Dr. Robbins is not convinced. Finally getting Anna Babic to agree to let him test for his own satisfaction, he ran every test he could think of only to come up with nothing more than the others had. Anna talked with Mother Mary along with two other visionaries. She also had a beautiful rose garden of all white roses, and for every person healed they received a white rose that never wilted or died.